What is level 2 ? In Level 2, we go into human physiology and the science of heat loss and thermal conductivity of materials. We go deeper into textiles, and the science of surface tension. Layering is explored in depth, touching a wide variety of activities from bikes to ski to high altitude and polar. Layering skill and know-how is the key factor which cannot be bought either online or in-store. The basis of our approach is personal experience that draws on long term innovation history and on others’ experiences. We humbly hope to provide you with enough food for thought to enable you to understand, select, improvise and develop further what’s best for you, anywhere, anytime, any activity. 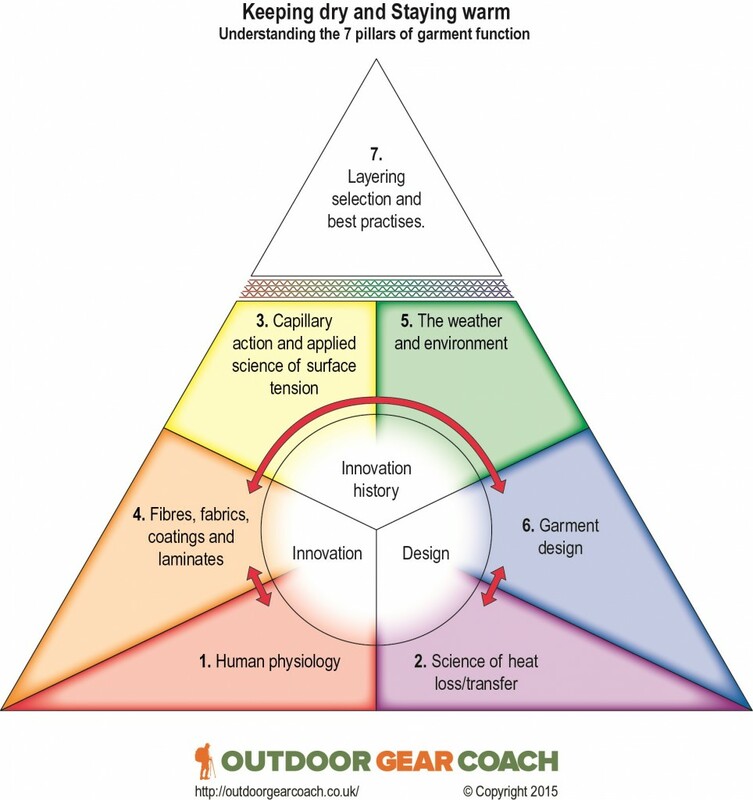 Our diagram below shows the 7 key areas which comprise the core information and knowledge needed for an in-depth understanding of outdoor garments. The science of heat loss and transfer. Capillary action and applied science of surface tension. Fibres, fabrics and coatings and laminates. Garment design, weather and environment. Last but perhaps the most important: layering selection and best practises. All of these relate dynamically with each other, design and innovation have created one of the most innovative industry sectors out there, and it’s now part of our proud history. Indeed, right from the early 1980s, the outdoor industry has taken over from the many famous brands who made things to keep you warm and dry in the days before central heating and air conditioned cars and workplaces became the norm. Providing innovative solutions to keeping warm and dry in the outdoors whatever your sport has become a specialist business, and long may it remain so. Such a business and industry needs to build on core knowledge and past successes in order to move forward.